Collected quantities of organic kitchen waste more than doubled after the implementation of the regulation, but its management has so far failed to achieve the set objectives. Deficiencies are particularly evident in composting. About 3,000 tonnes of such waste were composted in 2007, but so far only one entity obtained the environmental permit required for this activity. The indicator shows the annual quantities of organic kitchen waste generated and collected from households and the food service activities as well as the manners of its recovery. Organic kitchen waste constitutes a separate fraction of municipal waste with the classification number 20 01 08. The management of such waste is determined in the Decree on the management of organic/biodegradable kitchen waste (Official Gazette of the Republic of Slovenia, No. 68/08, hereinafter referred to as: the Decree). According to the Decree, the local provider of public service for collection and removal of municipal waste (hereinafter: public service provider ) is obliged to secure that organic kitchen waste produced by generators from households is collected separate from other separately collected fractions of municipal waste and of mixed municipal waste. The public service provider is obliged to ensure that the collected organic kitchen waste is delivered to recovery facilities pursuant to the Decree on the treatment of biodegradable waste (Official Gazette of the Republic of Slovenia, No. 62/08). According to the Decree, the public service must provide for separate collection of reception of kitchen waste from generators of kitchen waste from households in geographically rounded-up settlement areas with over 2,000 inhabitants and settlement density of more than 20 inhabitants per 1 ha no later than by 31 of December 2009, and in settlement areas with over 2,000 inhabitants and settlement density of more than 10 inhabitants per 1 ha no later than by 31 of December 2010. - To secure recovery of organic kitchen waste in compliance with the regulation governing the treatment of biodegradable waste. Since the implementation of the regulation governing organic kitchen waste, collected quantities from both households and food service activities have been growing. 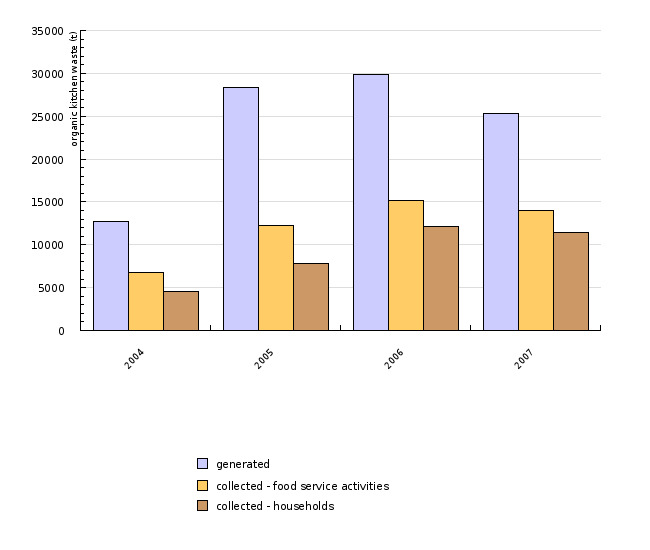 In 2007, 11,405 tonnes were collected from households and 13,956 tonnes from food service activities. The collected quantities more than doubled in comparison to 2004, when the new system of collection was set up. Prior to the implementation of the regulation, the majority of organic kitchen waste was deposited on landfills. However, the purpose of the regulation is not only to separate as much organic kitchen waste as possible from other municipal waste and to provide for their recovery, but also to prevent the entry of animal by-products into the food chain. The Decree therefore specifies the methods of further management and treatment of this waste in order to prevent spreading of possible infections and diseases. 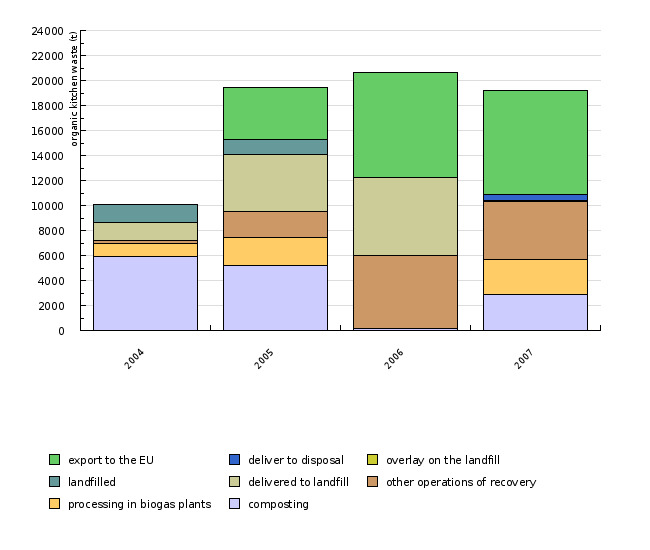 Data on the relevant waste management fluctuate from year to year. According to official EARS data composting of organic kitchen waste was carried out on a very small scale in 2006. The EARS also has no information on any recovery of organic kitchen waste in a biogas facility carried out in 2006. Comparison of data on generated and/or collected organic kitchen waste and data on further management of such waste shows that regulations regarding annual reporting obligation have not been observed. Furthermore, there is a notable discrepancy between the quantity of landfilled organic kitchen waste reported by landfill operators and the quantity of deposited organic kitchen waste reported by municipal waste collection and removal services. In short, the indicator reveals inadequate/unsatisfactory reporting on recovery and other handling of organic kitchen waste in 2006. In 2007, waste treatment was provided for 19,181 tonnes out of 25,361 tonnes of generated organic kitchen waste. Slightly less than half of it was exported, 2,912 tonnes of such waste were composted, and 2,799 tonnes recycled in biogas plant and for 4,609 tonnes other recovery methods were provided in 2007. The only liable entity having the environmental permit for recovery of organic kitchen waste by composting reported in 2007 of performed composting of organic kitchen waste. We further contacted those liable entities to which the providers of local public service of collection and removal of municipal waste, according to their reports, delivered organic kitchen waste for recovery. On the basis of this additional investigation, we found that the contacted liable entities actually compost organic kitchen waste without having the required the environmental permit for recovery of organic kitchen waste by composting. Despite of additional enquiries we find that reports have not been submitted by all liable entities that recovered organic kitchen waste or handled it in some other manner. The objectives have been taken from the 'Operational Programme on waste deposition aiming at the reduction of deposited quantities of biodegradable waste' (Novelation, March 2008, page 50) and from the Decree on the management of organic/biodegradable kitchen waste (Official Gazette of the Republic of Slovenia, No. 68/08). Up to 2007, the indicator contains data on waste, for which mandatory management was stipulated by the Rules on the management of organic kitchen waste (Official Gazette of the Republic of Slovenia, No. 37/04). The legal bases for the management of this waste changed on 23 July 2008, when the Decree on the management of biodegradable kitchen waste (Official Gazette of the Republic of Slovenia, No. 68/08) entered into force. • landfill operators who reported on deposited organic kitchen waste. Both the Rules and the Decree distinguish between organic kitchen waste generated in food service activities and those generated in households.